D-12 (ENGLISH, $15.00 per 100) Gold Monstrance, Host/Burgundy background, white writing "Divine Love" on front. 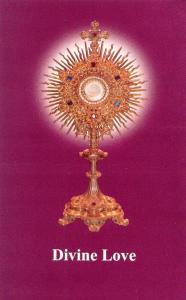 With beautiful prayers to the Eucharistic Heart of Jesus on back. 5-1/2 x 3-1/2.